Sisterhood is the main fund-raising arm of Temple Judea. Our funds are raised through attending Broadway Shows, Special Events luncheons and dinners, Card Parties, etc. We also handle contributions to various funds such as the Flower Fund, Oneg Shabbat, Tribute Cards and the Mitzvah Fund. In addition, Sisterhood maintains a beautiful well stocked Judaic Shop in the Temple building that is open to the public. We have also instituted six Shabbat Dinners for this year which is intended to bring about camaraderie amongst our members and guests. 2. Dear paranoid people who check behind shower curtains for murderers: If you find one, what’s your plan? 3. A recent study has found that women who carry a little extra weight, live longer then the men who mention it. A beautiful way to congratulate, memorialize, or honor a loved one’s occasion. The cost is $18.00 to be a Sisterhood sponsor and earn full donor credit. Wedding, Bar or Bat Mitzvah, Birth of a baby, Graduation, Birthday, Anniversary, Yahrzeit. Call Sharon Probolsky 949-716-8354 or email sharon@probolsky.com. Let Sisterhood be your social secretary for Birthdays, Anniversaries, joyous, and sad occasions. Just call or write and we will do the rest. Personalized messages upon request. Call Elaine Gold 949-859-6722. Forms are available in the office. Make checks payable to Temple Judea Sisterhood. Minimum charge $8.00 per name. Click here for the monthly President’s Message. 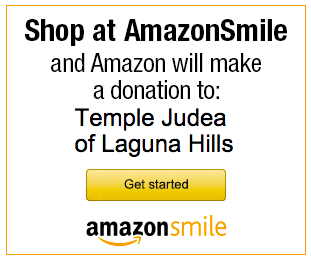 Shop and support the Temple with every purchase!